Ax-1900 AMPHIOXUS, Branchiostoma floridae. Everyone should see a living example of this extremely important organism that comes closer than any other to the transition between invertebrates and vertebrates. 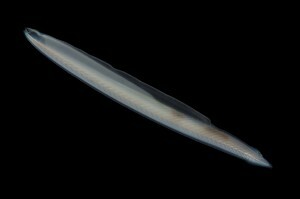 Unlike stiff, opaque, embalmed specimens the notochord can be clearly viewed in the living animal. Amphioxus burrows rapidly through sand by vibrating its body. They swim at night with lateral movements. Gravid specimens available March through June on special order. Size: 2-4 cm.